Tammy, let’s start with your story. We’d love to hear how you got started and how the journey has been so far. 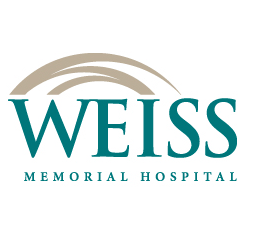 Weiss Hospital is down the street from us and they have a rooftop farm with raised beds and chickens at the parking garage, tended by people and organizations in our community, including refugee families. Friends of mine take care of the chickens and told me the director of medical education, Terry Tuohy, was looking for volunteer beekeepers. I love an adventure, nature, and learning new things, so I partnered with a friend, Bethany Wright, and volunteered. Weiss funded all the necessities; the hives, the bees, the tools, and the protective clothing. 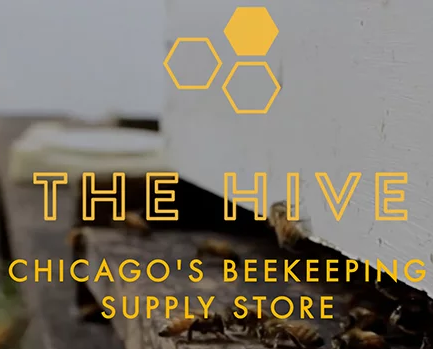 We bought everything from The Hive, a Chicago Beekeeping Supply Store. The manager, Naaman Gambill has been a huge help to us by being available for hive checks, giving great advice, and rescuing one of our hives when the queen died. Bethany and I had done a lot of research, attended seminars and workshops, and prepared the area on the roof before we bought the bees. We put on the gloves and hat and jumped in. We were nervous about getting the bees into the hive. They came in a wooden screened box and we had to bang them out onto the honeycomb frames. The first thing the bees did is fly away and poo. On everything. The hives, the car, and of course, us. They held it in for the whole trip. They are that fastidious about hive keeping. We have two hives of Carniolan bees, originally bred in Slovenia. These bees are prized for their gentleness, superior navigation, their ability to adapt to environmental changes, and their strong wintering strength. I’ve gotten stung a few times but it hasn’t dampened my enthusiasm yet. Honeybees are fascinating creatures and the more I learn, the more excited I get. 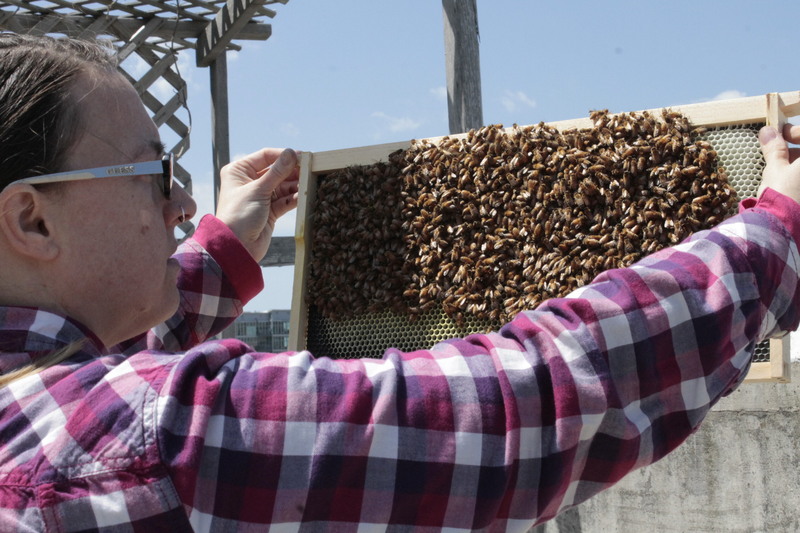 Our main reason for keeping rooftop bees is, of course, the benefit to the environment; more pollinators equals more food. About one of every three bites of food is made possible by honeybees. Our little apiary pollinates the gardens on the roof as well as the wildflowers, prairie grass, and trees within a 2-mile area. Weiss kindly allows us to keep, giveaway, or sell the honey we harvest. Since our bees were fed with sugar water the first few months, the honey wouldn’t be pure. We left it in the hive for them to feed on over winter and will have our first honey harvest in the fall. Look for us at the Weiss Hospital Farmer’s Market! Great, so let’s dig a little deeper into the story—has it been an easy path overall and if not, what were the challenges you’ve had to overcome? When we first established the hives, we couldn’t find one of the queens. If the queen is dead, the whole balance of the hive is off. The worker bees can lay eggs, but they will only be drones (male bees). The hive can’t survive for long without a queen. Naaman brought us a new queen and we had to introduce her to the colony, which isn’t always successful. Sometimes the workers will attack the new queen if they haven’t accepted her. It can be touch and go for a bit. That hive was weak for about a month before we started seeing eggs. My main concern is winter. I’ve insulated the hives the best I could, and hope the hardiness of this breed will prove itself. Click here to read the rest on Voyage Chicago! This entry was posted in Weiss Rooftop Farm and tagged Naaman Gambill, Tammy Perlmutter, Terry Tuohy, The Hive Beekeeping Supply Store, Uptown Apiary, urban agriculture, urban beekeeping, Voyage Chicago, Weiss Hospital, Weiss Rooftop Farm. Bookmark the permalink.